Emilia-Romagna is the most prosperous of all Italy's regions, and its capital Bologna enjoys one of the highest living standards among Italian cities (it ranked number one in 2007, according to Unioncamere Emilia-Romagna). A chunk of land running from east to west and bordered in the south by Tuscany, this is a highly agricultural region, a top producer of various crops and produce. 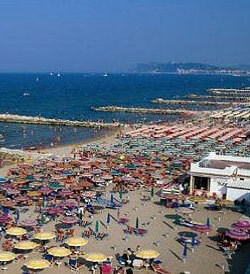 It is also extremely popular with tourists for its vast sandy beaches and well-run resorts along the Adriatic Sea. The seaside area not only provides many outdoor activities but an active nightlife scene. There is even a bus in the town of Rimini that brings people from one nightclub to another. When it comes to food, Emilia-Romagna is known for pasta (especially tortellini), balsamic vinegar, sausages, and of course Bolognese sauce. Its nickname is even La Grassa, or "the fat", because of its rich foods. Inside Emilia-Romagna, up in the Apennine Mountains, is the independent Republic of San Marino, one of the oldest and smallest countries in the world. Emilia-Romagna's capital, Bologna, is most famous for the sausage that bears the same name. However, in the land of its origin, the sausage is more properly called mortadella, with chunks of lard shot through it (these are missing in the American version of bologna). But mortadella is not Bologna's only claim to fame. It is also known for the University of Bologna, the oldest university of the Western world, famous for its free-thinking (some would say leftist-leaning) atmosphere. Nicknamed "Bologna la rossa" (Bologna the red), the city has a distinctive architectural style that makes use of reddish terracotta and brick. Italy's fourth-largest urban centre, Bologna is a well-run city with a sense of old-world authenticity, not yet spoiled by tourism. Wander into the Piazza Maggiore and you'll find an ancient plaza surrounded by medieval buildings and populated by garrulous locals often engaged in colorful discussion. The city's historic quarter is spectacularly beautiful, filled with medieval and Renaissance marvels and the magnificent Fountain of Neptune. And its winding, porticoed streets make Bologna the perfect city to walk around in. Bologna's loveliest residential district is quite likely its old Jewish Quarter (Ghetto Ebraico). This old area is strewn with tiny cobblestone streets and is very quiet and relaxed. There are areas of Bologna can be considered rundown or "gritty" (such as its university district), but overall it is a very safe city.